Hi BBC2 here and I have been baking bread over the last week or so and ended up with three half loaves of bread going stale, doh! I decided to make a bread pudding so I popped the end of a leftover loaf in the freezer until I had enough left over bread to make the pudding. It’s a cheap and tasty way of using up leftover and/or stale bread for a pudding, that’s just as nice hot with custard or cold on a picnic, or in a lunchbox. BBC1 would say that it’s down to my being a cheapskate and too tight to throw anything away, and there maybe some truth in that about not throwing anything away, but I still like this as a pudding. Try it and see what you think and please do let us know. A large loaf of stale bread, or use a mixture of different breads, that you’ve saved by freezing leftovers. Cut the bread up into one inch squares and put into a large bowl cover with water and leave to soak for half an hour or so. While the bread soaks grease an ovenproof dish (approx’ 12″ x 8″/30cm x 20cm) with a little butter and preheat the oven 180c fan. You should also gather all the ingredients together ready to assemble the pudding (I find it’s a good idea to mix the mixed spice with 6 tablespoons of sugar beforehand) as you need to use your hand to ensure that the mixture is even. Now take your soaked bread and squeeze out the water, put the bread pulp into a bowl and discard the water. Now add the mixed fruit to the bread pulp and mix, then add the suet and the sugar spice mix and mix it all together. Transfer the mixture to your greased oven dish and loosely cover the top with tinfoil. Cook for 1 hr 15 minutes then remove the tinfoil and cook for 15 minutes more. It should be dark brown when cooked, remove from the oven allow to cool for 15 minutes or so then sprinkle with the 2/3 spoons of reserved sugar. Serve hot with custard, cream or ice-cream, or eat cold with a nice cup of tea. Hope you like it! Tags: bread, bread pudding, dessert, mixed fruit, mixed spiced, pudding, suet, sugar, sultanas. Bookmark the permalink. I can’t say how many times I’ve made this. It’s scrummy. Best recipe and everyone loves it and I am always asked when is the next one . So glad you like it! Is by far our most popular post. Thanks. I’m currently in the Philippines and I am down to my last 50g of Atora and it’s not available here, so my only alternative is to use Crisco do you think that would be acceptable? Forgot to add that I made this recipe about a month ago and it was perfect everyone loved it of course. Now they and myself want more lol. I think that as long as you use some form of fat it should work. Some people I know use butter instead of suet. Good luck! Thanks Judy, I will give it a try. Marc, I’ve made bread pudding for literally half a century, using my mothers’ “recipe”….she never weighed anything and she never ever used suet. I did try this recipe, just out of curiosity really, and it’s a very good one, but I didn’t like the suet. I’ve always added a couple of beaten eggs to mine and I definitely prefer it. I’ve since used this recipe, for quantities, omitting the suet and adding the eggs and, in my personal opinion it was a better texture. (Apologies to BBC1 and BBC2). No need for apologies, taste is taste. Thank you. Confirmed for me my old mums recipe that I have now handed down to my 47 yr old son We love this plain yet delish recipe. Ta ! So glad it’s worked for you and hope it works for your son. thanks Pam! I followed your recipe to the letter and what a treat! I doubled the recipe and filled one large Pyrex dish. It’s very moist, crunchy and full of flavour. I’ve had to use fresh crusty bread and rolls as I didn’t have stale bread so may have made it more melt in the mouth . Thank you so much for the recipe, you’ve made my husband’s day. So pleased you both liked it. Thank you for your kind words, we appreciate your feedback very much! So pleased it works for you. Thank you fr your kind words and hope you can find other recipes on the site! So pleased you like the recipe. Can’t beat good old fashioned bread pud! It is by far our most popular recipe and my 94yr old mum is amazed her recipe gets over a thousand hits per month! Thank you for your feedback, it is much appreciated. Hope it’s as good as your mums one! 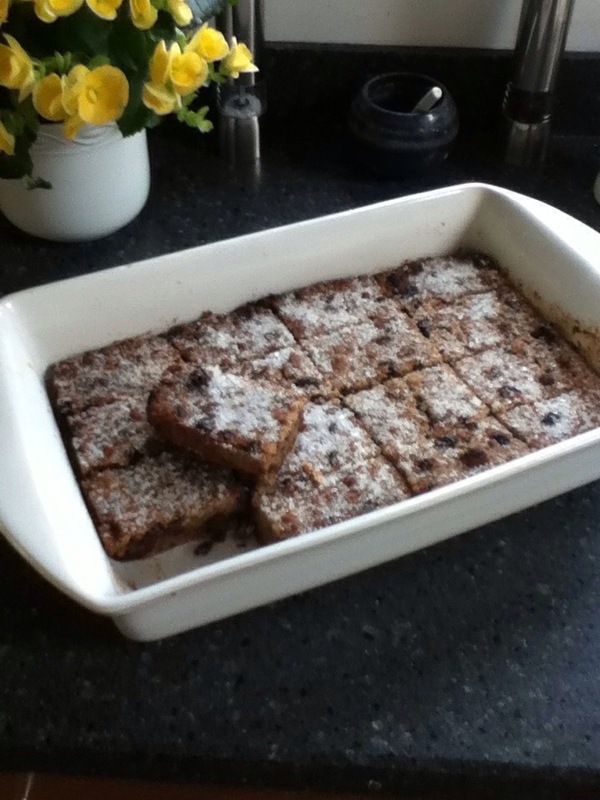 I have just made a Bread Pudding today, using my Mums recipe. Mine sometimes looks a bit pale, but I always try to use up any dried fruit such as finely chopped apricots and prunes this makes it really moist and yummy. Looking at the other bloggers I will try the treacle or molasses as they have done. This sounds exactly like the recipe my mum used to make and so simple because when I was little we didn’t have complicated recipes or too many ingredients as it was made cheaply and to use up, not waste, bread. Looking forward to tasting this culinary marvel. Thank you very much. BBC1’s will be really chuffed to hear that! Hello hope your new home is coming along nicely, and you both be back here soon. Thank you Sheila. We finally have a kitchen and should be back on line before Christmas hopefully! My great auntie (born 1902) worked as a cook in service and baked something called Pudding Cruce (I never knew the correct spelling). Stale bread was definitely soaked in cold, black tea. This recipe looks very similar and as it’s been many years since I ate a slice, I’m looking forward to trying it. Very similar to my own ‘recipe’. In inverts because I don’t really have one. I was looking for cooking times because not made this for 20 years. Most of them have eggs and milk and the point of this for me is no dairy! I used any old stale bread with equal suet, dried fruit and brown sugar, tablespoon mixed spice and cinnamon. Comes out just like yours too! In the past I made with margarine if I did not have any suet. It is a versatile thing and I think many families had their own recipes. I cant wait to try this recipe. I have made 4 thus far all different recipes, but none have come out or looked as good as yours. I will let you know how it turns out. This is JUST like my grandmothers recipe In Australia we do not have the suet I remember in England. Our suet is mixed with flour, so do I just use the 100gms of the mix ? Or should I buy some suet and render it and use that ? Can’t wait to taste it . Not really sure. Suet in the UK can be sold mixed with flour to keep it dry and we would use something like that. Atora is the brand name here and that’s fine. Thanks for the reply. Are you in England (where you can buy Atora suet) or in Australia where you can only buy Tandaco Suet which is mainly flour. I don’t think Atora is available in Australia, unless someone can help me find it here. Yes we are in UK. So not sure re your brand. But you can order uk style suet on the internet I believe. Does not matter that your suet is mixed with flour -its going into a flour mix any way. And bear in mind that recipes for bread pud are totally flexible, a bit more of thhis or a bit less of that will not matter. Also I like to use brown sugar, but that is a personal taste thing. Can’t wait to make this bread pudding. This will be my fourth attempt. Previous recipes say to use melted butter. From memory I don’t remember mum or nan using butter. So was really pleased to see suet is used. I will report back when I have made it your way. We hope you like it and look forward to hearing from you, thanks. Great old-fashioned recipe guys, like most people i remember my mum making this, she would make between 4-6 lots in one go (thats how popular it was!) I like to add 2tbsp of black treacle to your recipe, trust me its yum! Great old-fashioned recipe guys, the use of suet is a must. I like to add a couple of tbps of black treacle too, never hurts to ‘tweak’ a great recipe! Hi, my nan and mum use to make this, but she passed away before she I got to know how to make it. I knew she used suet. that’s why I looked at your recipe, the other recipes I looked at never used suet. would like to thank you so much. I thought I would never get to make it like my mum or nan. it means a lot. We are so pleased that it holds such great memories for you and only hope that it lives up to your expectations…do let us know. Made this a while ago and it was just like being back in my mother’s kitchen. I then took it into work to share and everyone said the same thing. One of them even got emotional over the memories it brought back. For me, the suet is essential. Has to be generous otherwise you can’t taste the stodge. This recipe looks great. I make a bread pudding that I thought I remembered from my Nan and my Mum making but not with suet. I am 64 now so the recipe ingredients should I think be similar (what part of the country are your familt from if you don’t mind me asking) I have a bread pud in the oven now but will definitely try your recipe next time. Hi, it works every time. We are both from London originally, as was my Mum who’s recipe this is – BBC 1. Do give it a try it’s honest worth it! Thanks for the comment, by the way. Hi guys my dad used to make Bread pudding and used mixed fruit with no peel and cherries, he soaked the stale uncut bread in half milk and water, mixed spice, a hand full of sugar and that was it, I used to take the rest to school to share with mates. I worked with a cook in London who used melted butter as well which worked well. I make it here in Australia with mixed fruit, brown sugar, mixed spice and milk and water and white sugar on top although although it never seems to taste like the old man’s pudding. I will try your one with the suet and see how that goes. I have lived here for 40 years but still miss Bread pudding and my favourite Pie and Mash. This is my favourite from childhood. My Nan used to make it in the 60’s and my Mum and I now make it for my kids. My Mum always used vegetable suet and I now use vegetable oil and add an egg, gorgeous hot and cold! It is a great old fashioned recipe and you’re right it’s great hot or cold! I love your recipe it’s the closest tasting to my nan’s bread pudding I’ve ever found. Only difference is we’ve always soaked the bread in strong cold tea, (3-4 tea bags per1.5L water.) We also add an egg to the mix. Thank you. Fascinated about the tea, as have heard of milk but never tea. Should really work well. Also never heard of an egg in the mix. Will have to give this a go when we finally get our new kitchen set up! Hey I have made this so many times and always works a treat, however one question I do have is the quantity of bread, as you don’t have a measurement for it I never know if I’m using the right amount of suet to bread. As sometimes we have lots of left over bits and pieces rather than a whole loaf. How much would you say a large loaf weighs? Sorry it’s taken so long to reply but we’ve been moving into our new home. We think about 800gms to a kilo. Hope that helps! Can I substitute four for suet. My nan used suet and I hated it. My mum who was born in 1914 used flour and I loved it. Have been looking for a recipe like she used. As far as we know you can substitute butter or some other kind of fat for the suet but not flour. It needs a form of fat in order for the recipe to work. There is a vegetarian shortening fat that you could use we believe but you’d need to google a brand name for wherever you are. Someone else mentioned using butter instead of suet in an earlier comment. Hope that helps. Let us know how you get on. This recipe is fab – just like my mum used to cook. I take it down to our local on a Friday night and everyone loves it – the old guys in particular love it with their pints of bitter! So pleased everyone loves it! BBC1’s mum is now 93yrs. And she will be thrilled that so many people are enjoying her recipe…thank you! All ovens are different it’s the kind of thing you need to persevere with. Anyway, good luck hope it works out in the end! Recipe does say preheat oven to 180c fan. But I should think 175 will be ok, will just take a little longer. Do let us know. Hope you enjoy it! My Welsh grandmother used to make this and called it Wet Nelly. Haven’t had it for years – must try your recipe. Thanks! Hope it works for you and is as good as your gran’s! thank you so much i made this with my dad when i was little dad never measured things out so when i try to make it. it never goes right i tried yous and its brill. Wonderful! This is the nearest to my mum’s recipe I have found. She never weighed anything, just chucked it into the bowl. Wrapped cheap ‘bread’ does not work. I find leaving the bread to stale a bit is much better than a fresh loaf. I do add brown sugar to the mix. A large – very large – slug of whisky with some water to soak the fruit overnight really does improve the flavour. Have you tried it sliced about a half inch thick and fried with bacon is also delicious! Thanks! Agree with you re modern bread not being as good for this. Never tried frying it, what a marvellous idea thanks! Brilliant! We think that all recipes should be tweaked. After all you are the one who’s going to eat it😉. Glad you enjoyed it! Thank you, I have been looking for this recipe for many years after my family and I emmigrated to Australia in 1982, a year later my nan died and the recipe with her. I will be making this for my Dad when he next visits. It was delicious and just how I remember it and I know it will bring tears to his eyes. I just need it to cool a little longer and I will be having another piece and will reminis about my Nan and the time we spent with her. We are glad it’s what you were looking for. It always reminds us of childhoods and judging by the comments and the popularity of this post many others think so too. Hope your dad enjoys it! Every recipe for bread pudding i found didn’t include suet, until i came across yours. My mum used to make this for the family, and i want to make it for mine. We all used to help squeezing the bread out, but we would have used milk. As an alternative to baking it my mum also used to steam it, which can be done when using suet, and also great with custard. This was a Sunday, if any left Monday treat for us. Fond memories, and by the way great recipe.. Thanks Cherie! Yes, we used to help squeeze out the bread, fond memories. I seem to remember mum using milk as well sometimes, although I am not sure she ever steamed it, must give that a go when we finally get our new kitchen! My nanny used to steam hers in a white pillowcase and always made it at halloween. She never weighed anything she used to just say oh you will know hence ive been trying to find a recipe for years as she died a few yrs ago. I watched her make it for years as a child and i think she used milk too. Think i will try this recipe and see if it tastes the same. She also made sha buscuits which had all spice in them. They looked like a cookie but had the crunch of a ginger nut. Cant find that recipe either. Hope you like it. As for the biscuits, you could try a ginger nut biscuit recipe and just substitute the all spice for the ginger? Im using the atora shredded suet so do i measure 100g of it shredded and chuck it into the mix or do i have to add water to the suet and make it into a dough first before adding to the mix. Never used suet before! You don’t add water to the suet. Just add it as it is to the mixture. Basically it’s a fat and works in the same way as butter or lard would. Newer recipes for bread pudding can use butter, but we felt if it’s not broke why fix it? Thank you. We are so pleased you enjoyed it! BBC1’s mum is 93 this year and we think it’s possibly her mums recipe. So it’s truly ‘old fashioned’. Hope you enjoy it Linda! We love it and have been eating since we were kids. It’s truly a great recipe. Our parents and theirs new a thing about waste not want not as this was usually made at the end of the week with the ‘stale’ bread. Enjoy! I have followed my Grandmothers recipe for more than 30 years and we have always used milk not water and butter instead of suet. I also make it with a slightly wetter consistency so it turns out moist, not dry like some. Adding some banana also works a treat. We think there must be hundreds of family variations on this dish. So many of us grew up on this! Sorry, we’re not sure how that happens and not technically minded enough to know how to include a basic printable version. So if anyone wants to tell us how, we will try to include in future! Highlight the recipe, press ctrl+P, then select print selection on printer settings. Actually this time we got it from our local butcher, but normally we would get the stuff in a box. Must say the butchers suet made a great difference because of lack of processing we suppose! Yes this is the real thing with Suet. You can use margarine or butter but Bread pudding is just not bread pudding without suet! too right Maddy! I prefer the packet suet. mum used Atora but can only get Tandaco here in Aus. i’m disabled and my hands are a bit too far gone for sorting out butcher’s suet though have done it that way when I couldn’t get packet of suet. It has always amused me that they made it to frugally use up left over bread and then proceeded to add fruit, sugar, milk, eggs or whatever…. Hehe any excuse to make it! I like the BBC1 and BBC2 sounds like bananas in pyjamas! Lol! We thank you so much for your comments and appreciate your candour. Just love the thought of bananas in pyjamas! We’ve never done it, but we assume you can because of the fat content. Would be fascinated to know if it works!? Just checked and oven temp is there for fan assisted oven, you may need to put it about ten degrees higher for a normal oven. It usually takes an hour and a half all told to cook. This is just the recipe I have been looking for, do you know whether it freezes well? We hope you and your dad enjoy it. Let us know how you get on? Cheers! We are so pleased it worked for you. It’s really important that we remember these old recipes our mums and grans used to make! This is truly old fashioned and the method is new to me and very unique. I kept on wondering why they looked like brownies. Now I know why. I think this must taste really good. Thanks for sharing and have a lovely weekend! yes this is like the recipe i worked out as a teenager , way back when, , i used water not milk, margerine not suet , mixed fruit and a tbs of golden syrup, i am surprised at the covering with foil. will try that. thanks for your recipe. will try it out on our communiy cafe next week. Hope it’s enjoyed by your community! Just about to make some bread pud- ever tried a handful of dried cranberries as well as fruit ? Delish ! No, but sounds like a great idea!